Worst cities for allergies: Louisville, Knoxville, Baton Rouge, Oklahoma City, Jackson. Which City Has the Worst Allergies? Sorry, Washington, D.C., you are not the center of the pollen universe. Allergy season in Louisville, Kentucky. For some unpleasant things in life, it seems to be a point of pride to declare that you have it the very worst. People one-up their friends on who had the most embarrassing drunken weekend, argue that their mother-in-law horror story is the most outrageous, or insist that their city has with the worst traffic. It makes us remember that painful encounters and daily nuisances are shared experiences—making a competition out of it brings a bit of comfort. So if you are a resident of Louisville, Kentucky, congratulations: The Asthma and Allergy Foundation of America has awarded your city the dubious honor of having the worst allergies in the United States this spring. As we sneeze and sniffle our way through this year’s long spring allergy season—likely to last through June in most places in the country, according to the AAFA—it seems as fine a time as any for Louisvillians to enjoy your honor (as best you can). If you do not live in Louisville, don’t feel too defeated. The city’s position at the top of the list is tenuous, and it may very well be lost next year. The AAFA’s rankings, which are ordered by a formula taking into account pollen levels, allergy medication used, and number of allergists, change from year to year. East Coasters like to complain about allergies a lot, but their suffering is actually mild compared to that of folks in some inland parts of the United States. New Yorkers, Bostonians, and Washingtonians may believe that the country revolves around them, which has somehow convinced them that they must also be at the epicenter of massive swirls of pollen. But actually, if you live in Tennessee, Kansas, or Ohio, you have a much better shot at bragging rights next spring; cities in these states regularly make the top 10 worst places for spring allergies. This year Memphis, Tennessee, came in second, followed by Baton Rouge, Louisiana; Oklahoma City; and Jackson, Mississippi. Knoxville, Tennessee, occupied the top spot for three years in a row, from 2009 to 2011. Geographic features aid in making some places traps for pollen. 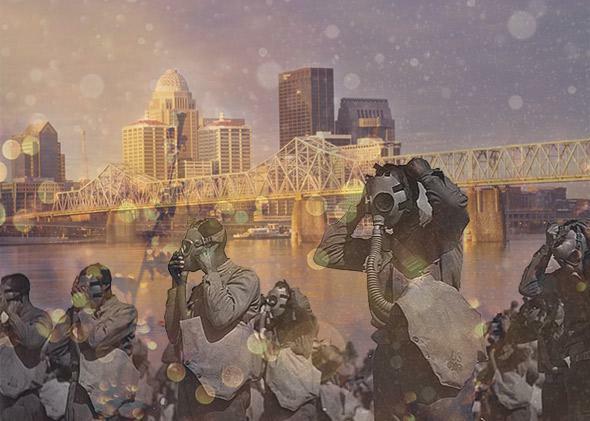 Louisville, for example, is in a river valley, ensuring that the city will be enveloped each year by the fine particulates its lush surrounding flora release to breed. The Cumberland Mountains to the northwest and Smoky Mountains to the southeast guard Knoxville, preventing allergy-causing pollens from its local trees (elm, hazelnut, willow, walnut, and mulberry, among others) from escaping. But of course, spring is not the only time for allergies. Anyone in Texas knows that from December to February, collective misery ensues as people suffer from bouts of “cedar fever.” (Cedar inspires such hatred in Texas that a group called “People Against Cedar” denounces the trees as “a plague.”) And in autumn, weeds and grasses throughout the country will bring new dustings of stuff to make your nose run. Looking at a map of the AAFA rankings, we might be better off if we all took a long vacation in the Pacific Northwest.